In 1870 – 1880, the artist wrote a whole series of paintings, in which he depicted with extraordinary skill absolutely ordinary people (peasants) who live their own lives, full of special emotions. 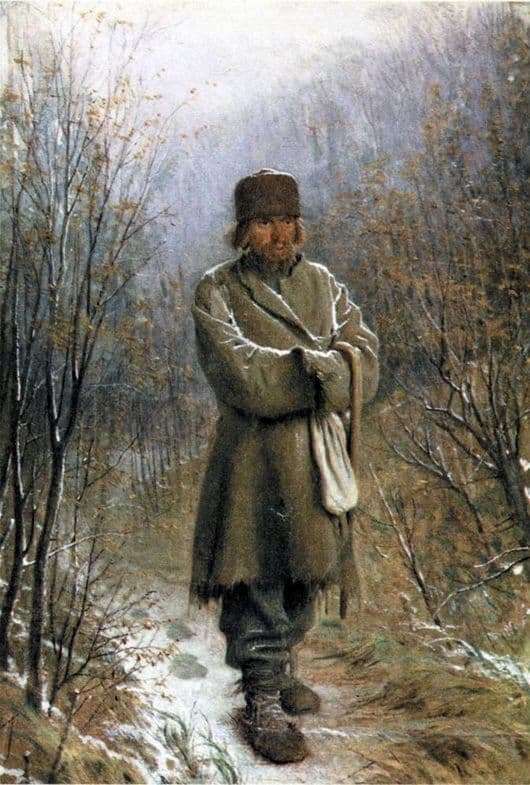 A peasant stands before us, standing on a snowy forest path. On it is an old caftan and traditional sandals. He put his hands in his sleeves, and his whole appearance reveals that he was very cold. Why did he stop? The reason is that he is thinking about something. Kramskoy conceived this picture in 1870. It is believed that the current name of the picture given Tretyakov. What does the hero contemplate? Perhaps the nature, and, perhaps, their family life. What does the peasant think? About his own poverty and hunger, about the malice that awaits him at home. We absolutely do not care who this little man is. It is surprising more. He is so detached from everything that surrounds him. The hero of the picture is completely immersed in himself. Before Kramskoy, nothing like this existed. A man stands and thinks. About what? Perhaps he himself does not know. His own impressions of the state in which he was in the process of his own amazing contemplation are dear to him. Kramskoy depicted not only an incredibly complex character, but also a whole type of social plan. This is the primordially Russian type of contemplators, who necessarily gave rise to incredibly strong characters, who often concealed a conflict with reality, hiding it under seemingly unpretentiousness. It was the contemplators who were the main part of the silent people, but sooner or later the anger spilled out. And in our time there are many contemplators among the people, although over time they began to look different. They have not yet declared themselves. Until now, they only absorbed everything that was happening in the world. Soon the time will come modern contemplators.